1. Halberg Chronobiology Center, University of Minnesota, Minneapolis, MN, USA.2. Institute of HeartMath, Boulder Creek, CA, USA.3. National Institute of Child Health and Human Development, Bethesda, MD, USA. Whenever an internal desynchronization in frequency occurs, the possibility of beats arises, as found and modeled earlier (1, 2). Adynamia observed about twice a year in a 62-year-old woman (JF) may relate to beats between desynchronized circadian systems, in view of differences in period found during the adynamic winter episode between salivary cortisol and vigor. More specifically, during (only) 41 days of a depressed adynamic episode, nonlinear estimates of the circadian period were 24.71 hours for self-rated vigor and 24.57 hours for salivary cortisol. The corresponding beat cycle length happens to be 0.99 year, corresponding roughly to two zero-crossings per year, Figure 1. Beat cycle lengths computed from other pairs of nonlinearly estimated circadian periods differed from 1 year, suggesting that the mechanisms underlying adynamia may relate to the adrenal. Whether the pineal may also be involved remains to be determined from forthcoming melatonin determinations. Extreme caution needs to be exercised, however, in view of the wide confidence intervals for the periods involved. Earlier simulations (not shown) illustrate the power of the nonlinear algorithm. The simulation consisted of cosine curves with periods of 24.0 and 24.8 hours plus noise, one synchronized with the societal day, the other desynchronized from it, synchronized with the lunar (tidal) day, observed during a 2-week span much shorter than the beat cycle. Among all methods used to analyze the data, only the nonlinear algorithm yielded the correct answer. In analyses by chronobiologic serial sections, a horizontal time course characterizes the acrophase of the 24-hour synchronized curve and an oblique time course corresponds to a delaying drift in acrophase of the curve desynchronized from the societal 24-hour schedule corresponding to a double tidal period (3). As a result, the relation between the two curves (with different periods) changes as a function of time: at one time, the two curves are in antiphase, and at another time, they are in phase (1). Desynchronization in frequency for a living thing can be external if one variable is organismic and the other is an external variable that fails to synchronize an internal variable and/or desynchronization is internal if both variables are organismic. While under ordinary conditions circadian rhythms are usually synchronized with the 24-hour day, likely influenced by both the societal and the natural photic day, JF’s vigor in the first month of her adynamia episode is synchronized by the lunar day. During the first month of the less well-documented summer episode (with manual vascular measurements), there was an external desynchronization in frequency of only vigor and systolic blood pressure, but not of diastolic blood pressure and heart rate. The latter variables are also desynchronized in the second month of adynamia. The frequencies characterizing the circulatory variables in self-measurements are elusive because of noise and the systematic bias of having no data during rest or sleep when lower values usually prevail. An external societal desynchronization of all variables investigated, i.e., not only of vigor but also of systolic and diastolic blood pressure and heart rate (as well as of salivary cortisol and DHEA) is found in the (automatically vascularly monitored) winter episode. While the abstract modeling is based on results of analyses, it is only an exercise in speculation, in need of extensive validation in principle if not in detail. Halberg F, Loewenson R, Winter R, Bearman J, Adkins GH. 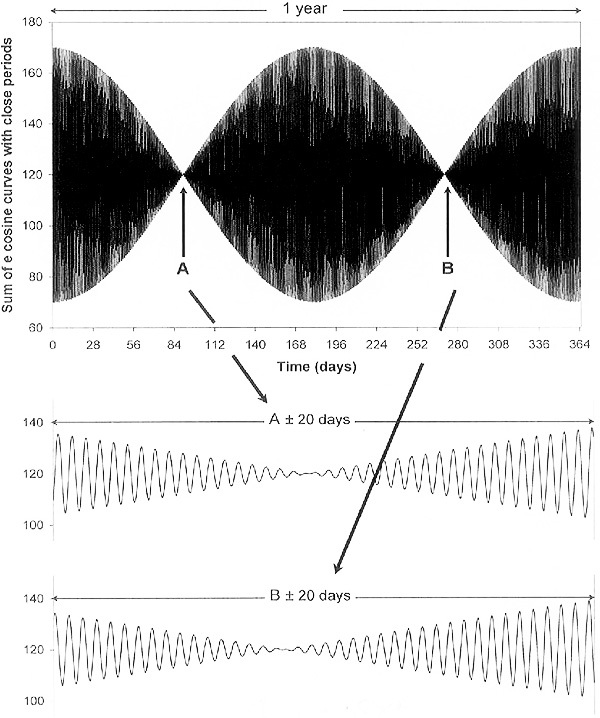 Physiologic circadian systems (differences in period of circadian rhythms or in their component frequencies; some methodologic implications to biology and medicine). Proc Minn Acad Sci 1960; 28: 53-75. Halberg F. Temporal coordination of physiologic function. Cold Spr Harb Symp quant Biol 1960; 25: 289-310. Doodson AT. The harmonic development of the tide-generating potential. Proc Roy Soc Lond A 1921; 100: 305-329. See also http://en.wikipedia.org/wiki/Arthur_Thomas_Doods. One Beat Cycle Includes Two Maxima and Two Zero-Crossings. Periods: 24.71 (wellness) and 24.57 (cortisol) hours.